Existing home sales rose 1.8 percent in May – their highest pace since February 2007 – according to the National Association of Realtors (NAR) anticipated monthly report that came out this week. In total, 5.53 million single family, condo and townhome sales came to fruition. Strong numbers considering that inventory issues – especially on the low-end – continue to disrupt many housing markets. The lack of available homes means that many would-be buyers are struggling to get into the market. It also means home prices keep rising. The median price of an existing home reached an all-time high in May. NAR said home prices during the monthsurpassed the peak of $236,300 set in June 2015. The median price of all homes sold during May was $239,700, up 4.7 percent from May 2015 ($228,900). May’s price increase marks the 51st consecutive month of year-over-year gains and shows the continued strength of the American housing market. We’re not without issues though, more on that later. “This spring’s sustained period of ultra-low mortgage rates has certainly been a worthy incentive to buy a home, but the primary driver in the increase in sales is more homeowners realizing the equity they’ve accumulated in recent years and finally deciding to trade-up or downsize,” he said. What Mr. Yun fails to mention is the lack of inventory is most noticeable in the low-end of the market – the homes that first-time buyers purchase. Those homes are not getting built – or renovated – at the clip of higher end projects. The latter being more profitable to builders and real estate investors. Only 2.14 million homes were for sale at the end of April, which at the current sales pace represents 4.6 months of inventory. Six months is considered a balanced market between buyer and seller. New construction permits and starts continue to creep up. However, the numbers are still woefully light if we want to cure the inventory issues which are hitting the low-end market especially hard. 726,000 – Single-family permits issued in May. Down 2.0 percent from April figure of 741,000, but up 4.8 percent from a year earlier. Permits for construction of multi-family units rose 6.7 percent from the previous month but were off 29.3 percent from the pace the previous May. 1,164,000 – Construction starts in May. Down 0.3 percent from April’s, but up 9.5 percent from this time last year. Single family starts led the way with a 0.3 percent rise from April to 764,000 units – 10.1 percent better than 2015. 988,000 – Unitscompleted, a 5.1 percent increase from April’s 940,000 units, but down 3.5 percent from May 2015. In the Midwest sales dropped 6.5 percent on a monthly basis, but are still 3.2 percent higher than last year. The median price in the Midwest was $190,000, up 4.8 percent from a year ago. Sales in the Northeast increased 4.1 percent and are now 11.6 percent above a year ago. The median price in the Northeast was $268,600, an annual decrease of 0.1 percent. The South saw sales rise 4.6 percent and are now 6.5 percent above May 2015. The median price in the South was $211,500, up 5.9 percent over the previous 12 months. Existing-home sales in the West jumped 5.4 percent, but remain 1.7 percent lower than a year ago. The median price in the West was $346,900, up 7.7 percent year-over-year. All in all, it’s another month with the same story. Plenty of housing market strengths to be encouraged about, but the ongoing worry of lagging supply continues to temper the excitement. 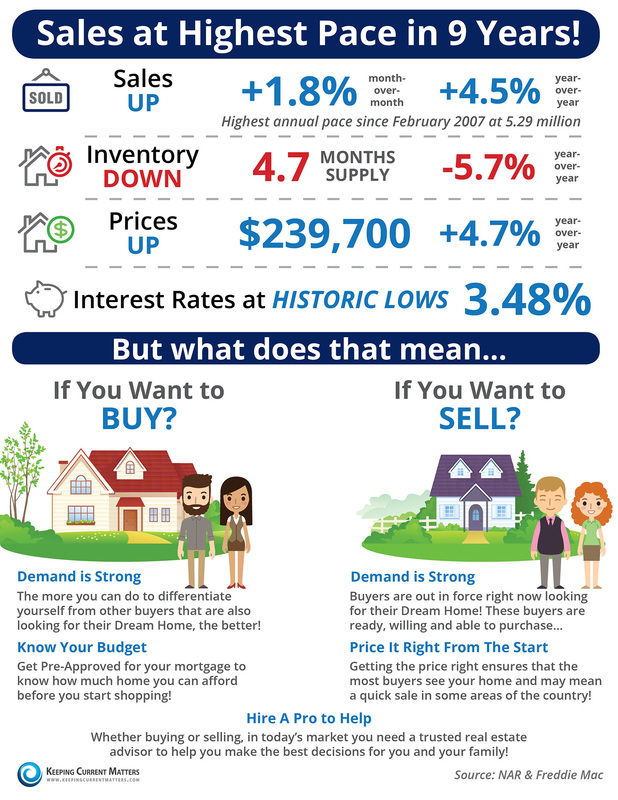 With mortgage rates still absurdly low, it is still a great time to get out into that market and buy home. Just be prepared to make a few offers before you finally snag your perfect space.